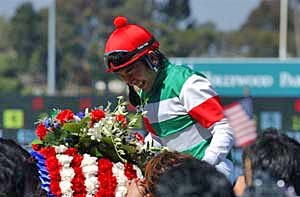 Cesario dominated 11 rivals while becoming the first Japanese-bred to win a Grade I race in the United States with a four-length triumph under jockey Yuichi Fukunaga in Sunday's $750,000 American Oaks at Hollywood Park. 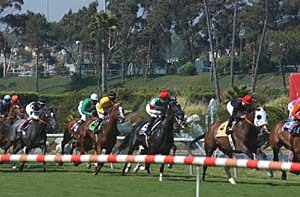 Breaking from the outside post, Cesario quickly moved into contention and was tucked in behind leaders Isla Cozzene and Thatswhatimean rounding the clubhouse turn. She made the lead with ease approaching the quarter-pole and cruised to victory while covering 1 1/4 miles over the Lakeside Turf Course in a stakes record 1:59.03. 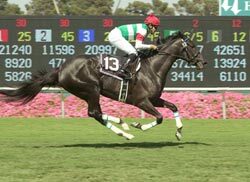 Melhor Ainda, the previously unbeaten favorite, closed for second money under John Velazquez, but never threatened the Japanese sensation. 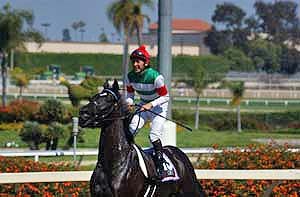 Singhalese finished another 1 1/2 lengths back in third under Garrett Gomez, while Irish-bred Luas Line was fourth and local favorite Three Degrees fifth. copyright © 2006 NEO Sense of Horse Life all rights reserved.